Odylique is new to me. It is a British brand, but they have now started offering their products to the US and Canada. They have a wide range of natural products to choose from and I chose four that I think would come in handy the most for me year-round. The harshness of winter was at the forefront of my mind, though. And who can go wrong with a skincare favorite of Amanda Seyfried?! Her skin is gorgeous! Spot-On Serum - So many uses! Heal a blemish, insect bite, minor burns. I used it the other day when hot water burned my wrist while cooking and it definitely calmed it. Pimples are rare for me, so I have not gotten to try it for that yet. I have a cut on my leg right now, so I'll be popping this on shortly and giving it a go. Active ingredients include lavender, tea tree oil, and aloe vera juice. Calming Rose Super Tonic - The thick glass feels wonderful in the hand. This has a strong rose smell, just a note if you have any sensitivities. I am not a big fan of rose scents, but it didn't last long on me. I wanted to try this based solely on the fact that it helps redness and sensitive skin. My skin does feel more hydrated after using this. I bet it would be wonderful to keep in the refrigerator during the warmer months for a quick cool spritz! Actives include rose essential oil and rose flower water. Ultra Rich Balm - To be honest, I hate the smell. So I can't bring myself to use it on my face or hands, but it feels and works wonderfully on my feet and elbows. Having to wear my snow boots nearly everyday does a number on my feet and using this balm is getting my feet sandal ready for when spring arrives. I keep forgetting to try it on my hair. Note to self! Actives include shea, coconut oil, beeswax, SBT, and extra virgin olive oil. Gentle Herb Shampoo - I love that this has a pump and it is sulfate free! The scent is light afterward (not a big fan of how it smells in the bottle) and it suds up nicely while still feeling gentle. My hair feels so soft after using this that I have not had to use any of my conditioners or treatments. And my scalp has not been itchy, which never happens.Actives include horsetail, coconut oil, chamomile, rosemary, aloe vera juice, and biodynamic nettle. I love the simple packaging and it would look great sitting on any vanity. I experienced no allergic reactions or redness from any of the products. I really like all of the products I chose, but the biggest winner for me is the shampoo. 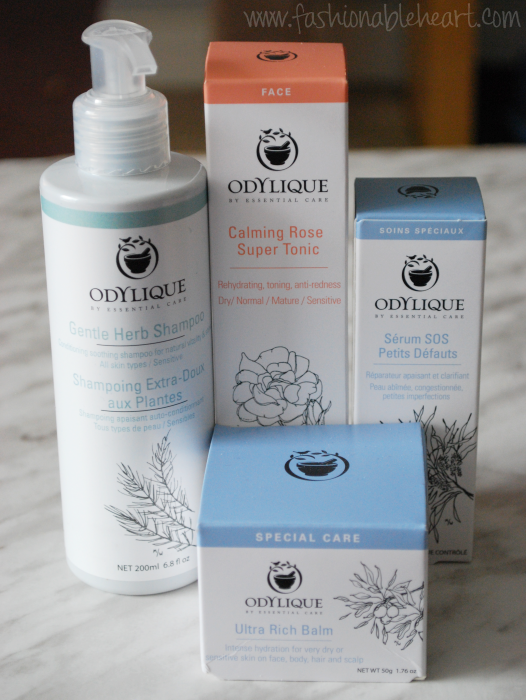 Odylique, founded by a mother and daughter team, is geared towards those with sensitive skin, but everyone can benefit from their line. The products are all handmade and natural and in recyclable packaging. You can read more about them here. This giveaway is open to my US and Canada readers to celebrate Odylique now being available in these two countries. No giveaway accounts. Once I have picked a winner, they will be notified by email. Odylique will ship out the prize to the winner. Contest ends on March 20, 2015 at 12AM EST. 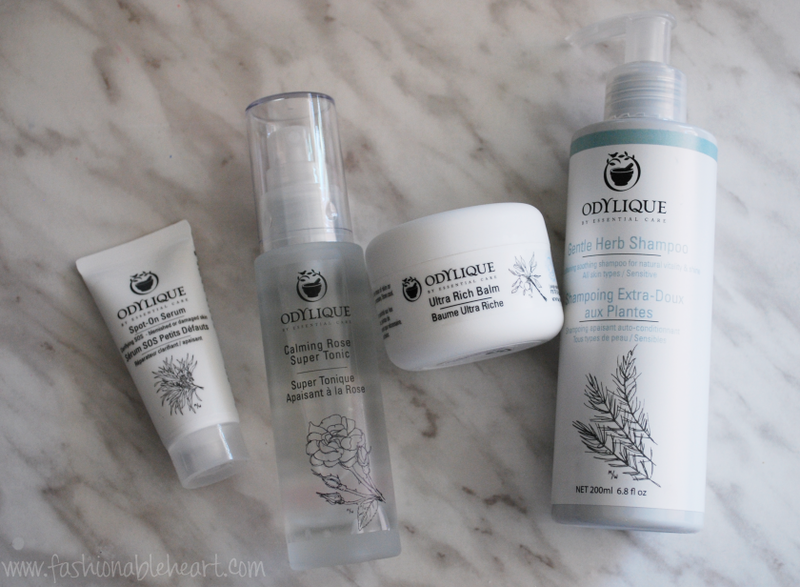 * I received these products from Odylique. There are no affiliated links and all pictures and thoughts are my own. They have graciously provided the giveaway prize. LOVE THIS ORGANIC CONTEST!!! Great post! The serum looks amazing! I'd never pass up a great toner either! I like dimmed lighting, quiet music and limited conversation. Really lovely giveaway! I love candles, music, lots of bubbles and tea.